Hummus is something that is almost always in our fridge. I use to buy it pre-made but then I realized I could save buckets of money by making it myself. I’ve made a bunch of different flavors…. garlic, jalapeno, horse radish, mustard, red pepper, spicy red pepper and sun dried tomato are a few I’ve tried. Sun dried tomato is the one featured here. 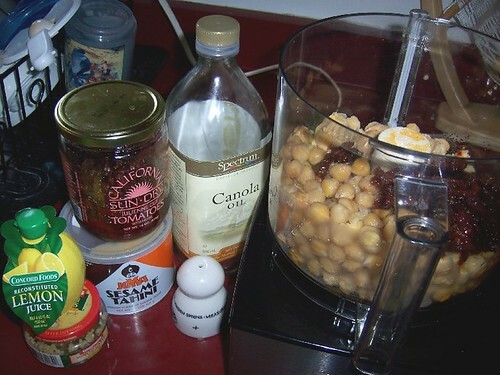 You can make hummus with canned chick peas (garbanzo beans), or cook your own from the bagged, dried chick peas. I do both, depending on how much time I have to invest. Canned chick peas are much faster but more expensive, and then you have the whole BPA issue with canned foods. Eden Foods makes organic beans in BPA free cans, but of course that comes at a price. They are more expensive, but worth the extra money in my opinion when it comes to your health. Another way around that is to cook your own from the bag! A past article from Vegetarian Times (that unfortunately I can’t locate now) once listed dried beans under the category of safe to buy conventionally grown, because any pesticides will be rinsed away during the preparation and drying processes. I feel comfortable buying conventional dried beans until I read or hear otherwise. 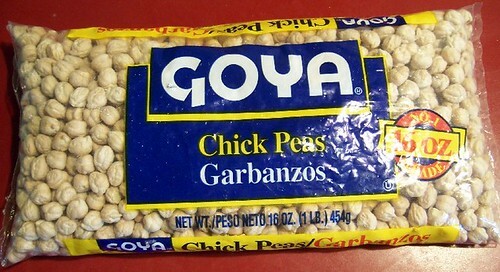 It’s also worth noting that chick peas/garbonzo beans are an excellent source of protein, fiber, iron and calcium too. If you choose to cook your own beans, I start by rinsing the beans in cold water and looking them over to pick out an foreign substances like small stones, as it suggests on the bag. Then I let beans soak in cold water over night (or at least 8 hours). Once beans are done soaking, I dump the water and rinse again, the move the beans to a cooking pot and add fresh water, enough to cover the beans and then some. Here I used half of the 16 oz and it made 3 cups of cooked beans. 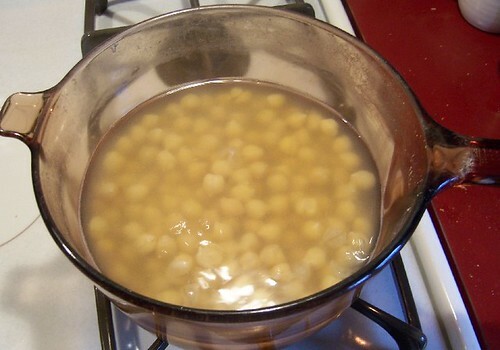 Bring to a boil, reduce heat and cover to simmer beans for about an hour. Once beans are ready, rinse in cold water and then throw them into the food processor. I usually eye ball the amount of ingredients but the purposes of this post I measured things out today. 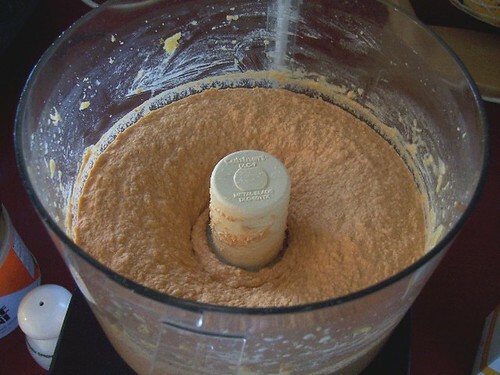 Load all ingredients into the food processor and fire away! If it seems to be too thick, I add water and/or a little more oil. The more oil you add the creamier it is. I am NOT afraid of healthy, monounsaturated dietary fats like canola or olive oil. Our bodies NEED fat for hormone production. Fats also help you go longer without feeling hungry because it slows digestion. 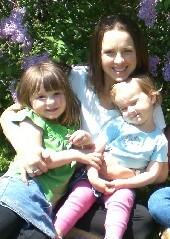 My girlfriend Jillian talks about this more in her book Master Your Metabolism. Another good reference is Dr. Andrew Weil’s book, Eating Well for Optimal Health. So add more oil if you like, just do so in moderation. Once blended, should be creamy and smooth. And yummy! We love hummus on Kashi crackers, with raw veggies, warmed in the toaster over on a whole wheat mini bagel topped with a little melted cheese and salsa… or my newest favorite way to eat hummus, a crack wrap! I didn’t know you had a blog either Alison! I started checking it out about 40 mins ago, but then started reading and wandering and ended up all over the web 🙂 Very interesting site and the food looks yummy!!! Definitely adding a link to yours! fitness rooms and sometimes times have got to locate the correct amount of weight before they’re able to begin with their do exercises routine. Start a jogging or walking club with some neighbors. Don’t set goals like “I will miss Ten pounds inside my first week”. – Rodeo: This is a famous restaurant in Delhi that shall be described as a Tex Mex place. on its roof gunning it through red lights, probably not the kind of advertisement the company had been looking for. Many mobile sites can remember what you previously ordered, making re ordering just a click away.